If you've planted your pomegranate (Punica granatum) in full sun in U.S. Department of Agriculture plant hardiness zones 8 through 10, given it regular water and protected it from temperatures under 10 degrees Fahrenheit, it could live for as long as 200 years. More likely though is that you will enjoy about 15 years of attractive flowers and juicy fruit as long as you give the tree proper care. Harvest pomegranates when the fruit reaches its full color. Although fairly drought tolerant, pomegranates fruit more profusely and reliably if you provide them with regular water and mulch them annually to help prevent moisture loss. Water once a week with 1 inch of water, to reduce the chances of fruit splitting or dropping from the tree before it ripens; it's not necessary to water if fall or winter rains do the job for you. Provide a layer of organic mulch 2 to 3 inches deep using ground or shredded bark, compost or any commercial mulch; ensure mulch doesn't touch the base of the tree. 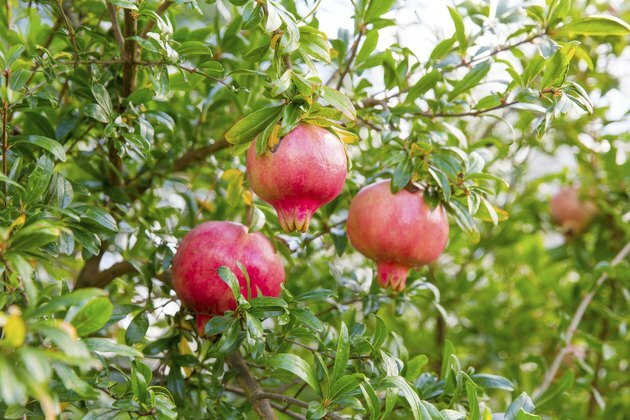 For maximum fruit production, fertilize your pomegranates annually. Apply 1/2 pound of nitrogen fertilizer to trees over 3 years old whose trunk diameters are about 3 inches in diameter, or 1 pound for larger trees whose trunk diameters measure about 5 inches or more. Fertilize once in fall or winter, or split the application and fertilize in both late winter and spring. Sprinkle dry fertilizer onto the soil, scratch it in with a hoe and water enough to dissolve the fertilizer, about 1 inch into the soil. Avoid adding too much fertilizer or applying it too late in spring, as those practices might delay fruit ripening or cause too much leaf growth instead of fruit production. Insects, such as flat mites, leafrollers and mealybugs, may cause some damage. However, no insecticides are suitable to apply on pomegranate trees, so removal of any diseased limbs or insect larvae by hand is your best defense. Look for leafroller larvae in the top of your tree in late spring and under leaves after fruit develops. A fungus sometimes affects pomegranate fruit, but there is no known control beyond removing any fruit that appears diseased. To keep your tree in an attractive, even shape or to keep it small enough for its space, prune it annually while it's still dormant in late spring before its flowers start forming as buds. Remove any dead branches and those that cross over each other, branches that interfere with walking around the tree and those that seem to be crowding one another. Also cut away any suckers -- thin green branches -- growing from the bottom trunk of the tree. Use loppers or snippers for pruning and disinfect them before and after using by wiping them off with a cloth soaked with rubbing alcohol.